Theater in the Now: Review: If Karaoke Be the Food of Love, Rock On! Review: If Karaoke Be the Food of Love, Rock On! Everyone wants to do Shakespeare these days. Sure, everyone loves the classic stories and the classic text and classic characters, but it’s been done to death, so figuring out a way to put a fresh spin on a Shakespeare classic can be a challenge. Fortunately, Three Day Hangover goes beyond the spin and puts their stamp on a classic. 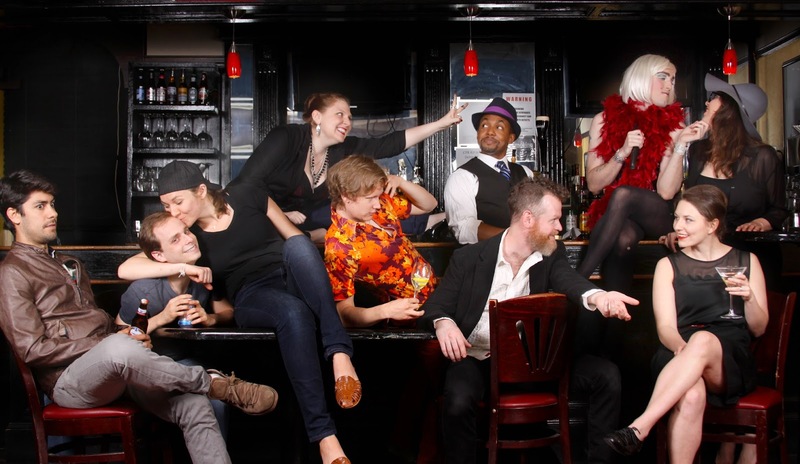 In their newest endeavor, Three Day Hangover takes one of Shakespeare’s most universally familiar tales and adds booze and music, giving you a brand new look at Twelfth Night. With a live karaoke band on stage, well, in the bar, include some brave audience participation and a drinking game to “that’s what she said”, this is a Twelfth Night you’ve never experienced before. Illyria, now everyone’s newfound favorite hangout, is home to a rom-com of missed connections and cross dressing where Orsino runs the joint, Sir Toby Belch mans the microphone, Viola poses as a busboy, Andrew Aguecheek is a Scandinavian horndog, Malvolio plays maître’d, Olivia is the girl at the end of the bar, and Sebastian and Antionio are best bros. By using a well-known play that translates nicely into the mainstream (thank you “She’s the Man”), corners can be cut as the audience can forgive story telling to make way for entertainment. Adapter and director Beth Gardiner finds the fun of the source material, assembling a strong cast to take on the big task of entertainer and host. When the cast gets to take the mic, we get some perfect karaoke choices including "Somebody to Love", "I'm Gonna Be (500 Miles)", and my personal favorite, "The Fox". The ensemble clearly had a blast, rockin’ out and engaging the audience from start to finish. The immersive experience adds a new level of excitement for the company as you never know when that “that’s what she said” bell will be run. The adaption brings the past and present nicely, with the company seamlessly being able to bridge the gap from Shakespeare to modern text. Leading the cast as Viola is Laura Gragtmans. Gragtmans plays the role with ease, highlighting the character’s loyalty. Her comedic timing is wonderful to watch alongside her castmates. Amanda Sykes is hilarious as vixen Olivia. Blake Segal and Perry Young as Sebastian and Antonio as the best bros play well off each other. The eventual pairing of Sykes and Segal allows for some of the funnier moments and images on stage. Rounding out the cast of great performances include Ben Charles, Nathan Crocker, and Coleen Harris as Andrew Aguecheek, Malvio, and Sir Toby respectively. The struggle of staging a play in a bar is ensuring every seat is a good seat, where the action can be seen or heard no matter where an actor stands. The unique set up was a bit of a hindrance at moments, especially the scenes at the bar. But the ambience does make up for it. If you’re looking for a fun time while still feeling cultured, check out Three Day Hangover’s Twelfth Night. Drinking will definitely aid in enjoying your night, and if you’re feeling brave, check out the karaoke set list.